Relax in our sun-filled living room in front of the fire or soothe your tired muscles in the hot tub! Skiing is just a mile away and our street is on the free shuttle line that runs through the Mount Snow Valley. Our Non-Smoking home boasts of an open floor plan that makes it perfect for groups of friends or for your family. It's kid-friendly with games and videos. We also allow pets, so you can bring your well-behaved family dog, too! We have a run attached to the house that will work for a dog as big as a Lab and the house is on a low-volume, dead end street. Best of all, you can walk down the street to some of the best pubs and restaurants in the Valley and we're less than a mile from the movie theater and shopping. Whether you come to ski or not, a great time is guaranteed! We have owned the house since we were in our 20's, when we ran it as a 'share house' with friends. Our kids have grown up skiing at Mt. Snow and we've been fortunate to be able to share our house with others through rentals. This house is currently for sale. Please inquire if interested. We bought this house so that we'd have a convenient, relaxing, family-oriented home to stay in when skiing in Southern VT. It's perfect for two families or a group of friends & relatives. We're a dog-friendly house in a quiet neighborhood. The local shuttle, the Moover, picks up at the bottom of our street and goes to Mt. Snow as well as into Downtown Wilmington. Our house is clean, open, and easy. One full bath, one half bath. Both remodeled in 2005. Our home is about one mile from the base of the Haystack section of Mount Snow and about 1.5 miles from the Main Base area. There is a mountain shuttle at the base of the street. There are three restaurants with bars and a boutique market at the bottom of our street. The Seven-Eleven is less than a mile away and also has groceries and a liquor store. We heat with propane, so it's always toasty. The wood stove supplements the heat. Linens are $100 and include all towels, sheets, blankets/comforters and pillows. The driveway holds up to 5 cars. Cable wi-fi available at house. We offer linen service at your cost. The wood stove opens in the front, with a screen for fireplace ambiance. Open floor plan living room. Spices & teas (basic) are here. Open floor plan kitchen has all amenities. The house is lightly stocked with condiments and has ample and current pots/pans & gadgets. Six chairs plus 2 folding. Three seats also at counter. 60" Smart TV. Login to your favorites with your account. We have some DVDs and videos. One mile from Mt. Snow. Discount ski passes offered to our guests. Five person jacuzzi is located in the finished basement. Hot tub is CLOSED from April-December. 1 queen, 5 twins, 1 queen sleep sofa. Five person jacuzzi in finished basement. Well-behaved dogs are welcome with prior notice. We have a portacrib, high chair and many children's toys. We make constant updates to furnishings, bedding, and accessories for the house. Please let us know if you have any special requirements. Owners are very flexible and easy to contact. They get right back to you. House is cozy, bright and sunny, and clean. Location is great with two excellent restaurants/bars in walking distance. Cozy house with a great location near the mountain! Our group of four had a great time at this house - specifically the location made this a great stay! Just a 5 minute drive from Mount Snow, and we really liked being able to walk to Last Chair/Nosh for dinner and drinks. The house was very clean and it was super easy to get in contact with Ellen, which was appreciated, especially when I mixed up the check-in instructions and thought we had to pick up a key. The house is cozy but worked well for our small group. 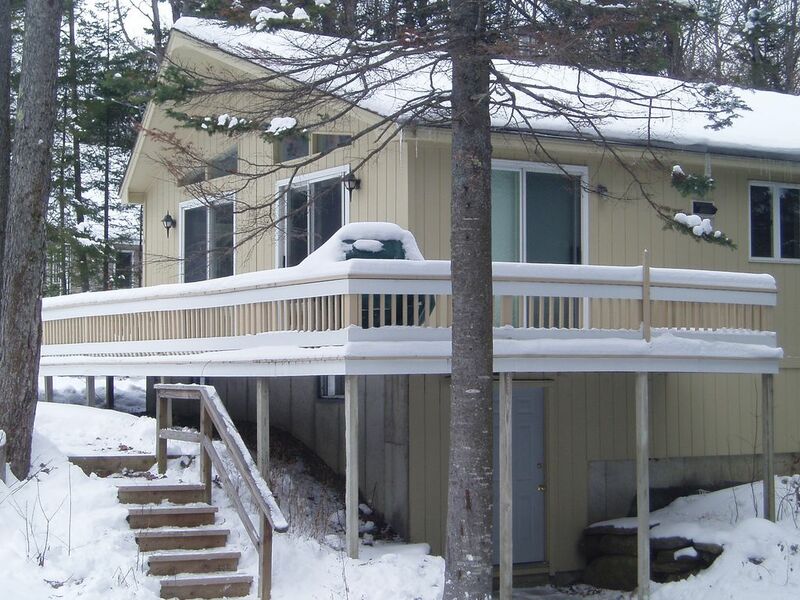 comfortable, very well maintained, very clean ... wood stove very nice! It was a great get away made easy by the loving care and comfort of the "home" away from home. Ellen was real easy to work with and took care of the setup and processing real quick. House is a great location on a nice street, close to good restaurants. 1 mile to the mountain. Would stay there again for sure! Everything was amazing and exactly as described. Will be back again. Loved the hot tub and family room. Perfect home for a family ski weekend! This home is 5 minutes to Mt. Snow, warm and cozy. We were 6 adults and our 2 yr. old grandson. Ellen and George were so accommodating, even purchasing a brand new pack n' plan and high chair for the baby! The kitchen had everything we needed, plenty of parking and comfortable beds. The best amenity was the indoor hot tub! No running in the freezing cold in and out of the tub. Just what we needed for our old bones and a couple days on the slopes. We would certainly rent again, even in the summer to go up for a couple rounds of golf! Thank you Ellen and George! Thanks, Paula. You and your family are welcome back any time. We're so happy that you enjoyed yourselves! Let us know @ summer - we offer a promotion for return renters with a third day free on all weekend rentals (non-holiday). Very close to entrance to VAST trail for snowmobiling. There are three restaurants at the entrance to our road, a short walk from the house. We are also on the MOOver shuttle, which runs loops between Mt. Snow and Downtown Wilmington. $150-$450/night depending on season THIS HOUSE IS NOT AVAILABLE AS A FULL SEASON RENTAL Rates: Winter 2016-17 $295/night, mid-week, non holiday $395/night weekends, non holiday All other holiday periods - Christmas/NY, MLK Weekend, Feb Presidents Week, $449/night. 10% discount offered for a full week stay. We offer all winter renters discounted tickets to a local ski area. Please inquire.